“Fast disappearing from data centers are power-hungry spinning hard disk drives that hum, buzz, run warm (or even hot), require fans and expensive cooling systems, and can crash unexpectedly. 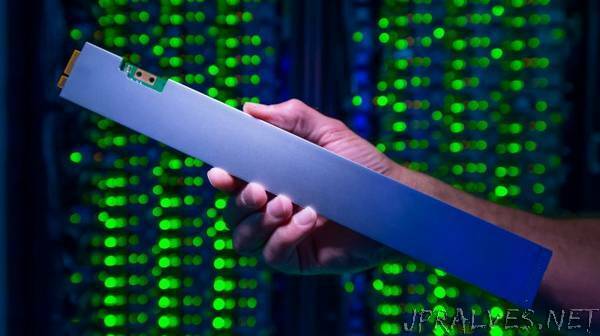 Intel’s newest solid state drive, the Intel® SSD DC P4500, is about the size of an old-fashioned 12-inch ruler, and can store 32 terabytes. That’s equivalent to triple the entire printed collection of the U.S. Library of Congress. The new SSD is Intel’s densest drive ever, and is built on Intel® 3D NAND technology, which stacks memory cells atop each other in multiple extremely thin layers, instead of just one. Memory cells in the P4500 are stacked 64 layers deep.